Convention of arrows: the yellow arrows are the math impacts of the MMU1. Rule of Thumb guidelines of the math boosts by the prominent CMOs in the USA (based on math results of the National Report Cards, Common Core math, and state math tests of the USA, but largely anchoring on NAEP). 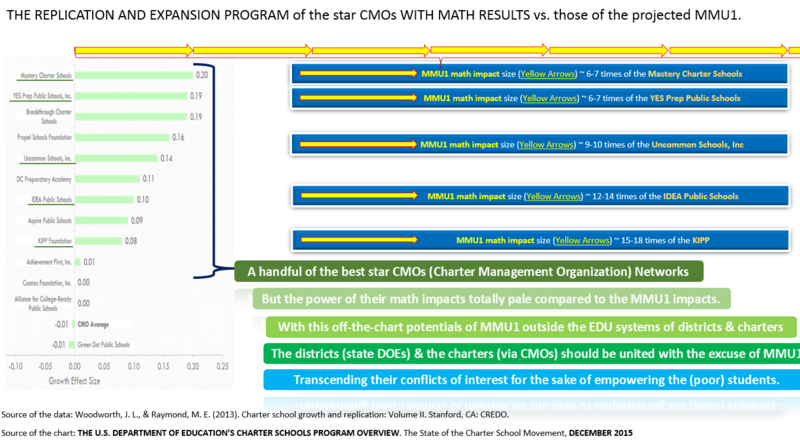 Note that the MMU1’s math EDU impact magnitude is far gerater than the overall math impacts of the very best of the CMOs in the USA. As two of the largest Charter Networks, let’s see the math impacts of the KIPP and Uncommon Schools using the CREDO data published in 2013. Note that as KIPP and Uncommon Schools expand from their main grounds of LA/Bay areas or NYC area to interstates, their math impacts reduce drastically in other expanded cities to less than the half of the original impacts. Although this report was from 2013, I think that the general pattern is clear and a warning sign of the rest of the star CMOs positioning to grow rapidly. The following patterns are the overall for the past 5-10 years or so operations of the prominent CMOs for their math achievement levels. The following is the roughly estimated values as the each math assessments vary. 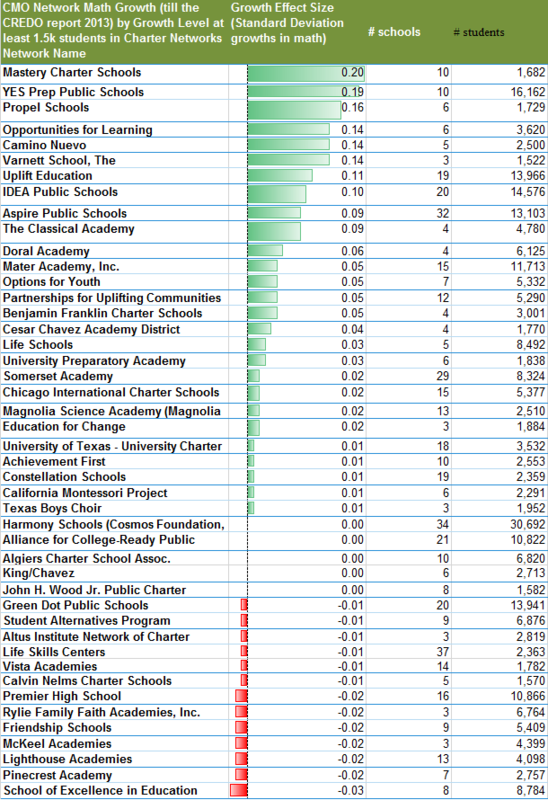 The estimations in this table is assuming for the CMOs that scale to at least 70-100-150 schools as the typical bigger size CMOs tend to have 10-50 schools in their CMO networks (as elsewhere Lee demonstrates that expanding CMOs such as KIPP, Achievement First tend to lose math impacts to only 50-70% of their impact during their earlier heydays). 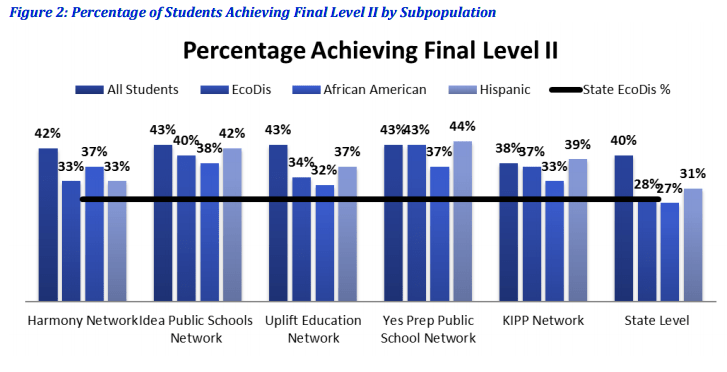 Final level achievements of the top 4 CMOs in Texas seem to be about surplus 15% higher compared to the state Economically disadvantaged average while KIPP in Chicago is about 10% higher (although this is for overall, not for math surplus exclusively). So I extrapolated the fact that the KIPP math average is about 10% higher to roughly estimate that the top 4 CMOs in Texas may have about 15% higher math scores. NOTE: these top 5 high performing CMO average overall is only a few % higher than all student average from the Economically disadvantaged average of about 28-29%, raising in average about 15% or so (NOTE: KIPP is raising about 5% less than the rest 4, by raising in average about 10% J). To make my estimated math impact comparisons above more dependable, I made the following top 45 math performing CMOs based on the CREDO report 2013. I included only the CMOs with at least 1,500 students in the report because the CMOs tend to lose steams quickly with the inter-state expansions as observed in KIPP and Uncommon Schools.